Bobbi Kristina, 21, the only daughter of late singer Whitney Houston, is reportedly brain dead. She was found unresponsive in a filled bathtub inside her Georgia home yesterday. Her husband who found her called 911 and she was rushed to the hospital where it was later reported that she was stable and still breathing. Some sites said she was in a medically induced coma because of brain swelling. Now other media outlets, who claim to have spoken to staff at the hospital where Bobbi Kristina was taken, are going further to say that she's brain dead because of a lengthy lack of oxygen to the brain. They say she had attempted to commit suicide because of some problems with her husband of one year, Nick Gordon. 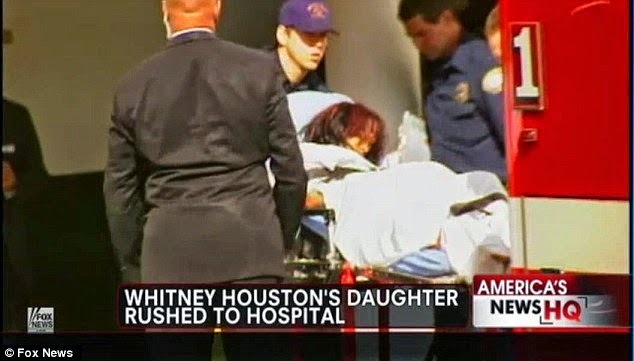 MediaTakeOut.com just exclusively spoke to a hospital worker at North Fulton Hospital, where Bobbi is staying. We're told that Bobbi Kristina is "brain dead". The worker, who asked to remain anonymous said, "She lost oxygen to her brain for too long - she's not going to be able to recover." We asked if the worker was sure about Bobbi's condition, and they replied, "Yes, very sure." We're also told that her father Bobby Brown, and family friends including Tyler Perry are at her bedside, praying for a miracle. Let's all say a special prayer for Bobbi tonight. MediaTakeOut.com just learned MORE information - on what happened to Bobbi Kristina yesterday. As you all know, Bobbi Kristina was found FACE DOWN in a bathtub - and NON-RESPONSIVE. She was rushed to the hospital and placed into a medically induced coma. And we spoke EXCLUSIVELY to a person at the hospital - who described Bobbi's current condition as "brain dead". Her family is currently praying by her side, asking GOD for a miracle. Initial reports were that Bobbi Kristina may have had a DRUG OVERDOSE . . . well now we're hearing otherwise. A person CLOSE to the Brown family tell MediaTakeOut.com exclusively that they suspect that Bobbi Kristina may have COMMITTED SUICIDE!!! The insider dropped EXCLUSIVE TEA to us. The tipster explained, "Bobbi and [husband] Nick [Gordon] were not together. They were staying apart. Nicki got a call from Bobbi Kris and he felt hat she was try to hurt herself. So he [and a friend] rushed home, and they found her." We're told that Bobbi Kristina was in a DEEP DEPRESSION - caused by trouble in her marriage, and FRUSTRATION with the portrayal of her mother Whitney in a recent Lifetime Biopic movie. Contrary to MTO's report however, Bobbi Kristina's cousin, Jerod Brown, told Sky News late on Saturday that she is currently "doing fine." "She's pretty good right now, she's around family. We're just praying for a speedy recovery, that's it." When asked about the upcoming anniversary of her mother's death, Jerod said she is "in good spirits." "Of course she goes through the grieving because it's still fresh, but other than that she's doing fine." Jerod also tweeted out his family's thanks for the support and prayers from the public for Bobbi Kristina. Another source close to the family also told PEOPLE that Bobbi Kristina "is stable at the hospital." "It's expectedly a very tense time for the family. And they are closing in on [protecting] Krissy. It's been a difficult time for Bobbi Kristina, who's struggled in the years after her mother's death. [Krissy] "has been vacillating between extremes for a while now and is fighting grief and demons of her own creation. The loss of her mom and her intense craving for attention of any sort are just the tip of her mountain of issues." So far, both the hospital and the family are yet to release any official statement on her condition.